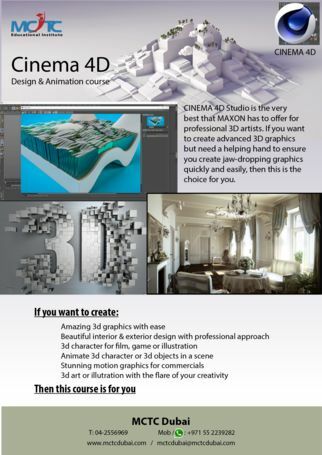 #Cinema 4D Studio is the very #best that #Maxon has to #offer for #professional 3D #artists! We at MCTC Dubai will teach you Cinema 4D course in a professional way and our course is designed in a manner that is a perfect suit for both beginners and seasoned professionals. Cinema 4D’s legendary reliability also makes it perfect application for demanding, fast-paced 3D production, and a range of attractively priced software packages available to fit ant artist’s needs. Register today with MCTC Dubai, leading training center in Dubai and take advantage of Cinema 4D’s wide range of tools & features to quickly achieve stunning results!! Take a walk to us to get a free demo class at any time, we are located in Deira, Dubai….